Many of us may not be new to meditation and especially the Eastern styles of meditation where we use mantra as part of meditation practice. Join Ven. Angie for an explanation of how "mantra works" to develop our heart and mind in qualities of wisdom and compassion as well as the power of chanting mantra for healing the body. The evening will include some teachings and meditation. 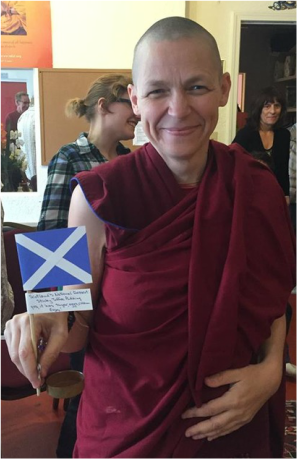 Venerable Angie Muir, a Tibetan Buddhist Nun from Scotland, has been ordained for 18 years. During this time she has studied and practiced in the East — India and Nepal —​ and the West, Scotland and the USA. She has also been centrally involved in serving, teaching and leading meditations at these places. She currently resides in California, serving at Lama Zopa Rinpoche's private residence.